It is 1.10 in the afternoon and I have just settled down to eating my lunch in the TV room when suddenly I hear a phatak sound in the veranda. It appears as if something has collided with the glass panes of the living-room doors. Placing the tray on the sofa beside me and calling out loudly to Kuldip, the houseboy, I rush out to the adjacent portico. I see a little dove on the red chair. I think that I know what has happened. It has, in full flight, hit against the glass and is momentarily stunned. Not seeing it move or flutter at all, I pick it up. It still doesn’t move. I hold it gently in the palm of my hands and ask Kuldip to quickly fetch some water. He sprinkles a few drops on the bird’s eyes and face. We hope to see a revival, but there are no signs of it. The dove’s eyes are closed. Its body feels warm against my skin. I sit in the chair and wait with it resting in my hands. Minutes pass. I ask for a box to be brought where I can keep it safe for a while. But it seems to be of no use. The dove’s neck droops completely and we register no heartbeat. It must have been in full flight when it crashed headlong into the glass pane, resulting in its immediate death. It slowly sinks in that the dove is no more. I am the one stunned. Five minutes ago, it was flying around and now its life has been snuffed out and it lies lifeless in the palm of my hands. Often a collision will temporarily stun a bird that flies off, seemingly recovered, in a few moments. But many times these birds die later, from internal bleeding or brain injury. On the internet I learn that more than 100 million birds are killed every year due to collisions with glass surfaces. Glass is invisible to birds, and usually reflects the images of trees, bushes, potted plants, and the sky or the natural environment behind the glazing. Birds see this reflected natural habitat, but not the glass itself, and therefore fly directly into it. Glass is a horrible and unforgiving killer, mutilating and destroying these beautiful creatures. I discover later, again on the internet, that there are many solutions for preventing such catastrophes. Some ways of eliminating or reducing reflection are – incorporating bird-safe glass (that appears normal to humans but is visible to birds); installing exterior window screens; using etched glass; drawing patterns with soap or just leaving the surfaces a little dirty; and drawing vertical lines with a highlighter on the inside surface of the glass. Birds see ultra violet light, we do not. Sometimes, lines of fluorescent ink on glass, when exposed to ultraviolet light, makes the surface visible to birds. I am sad. 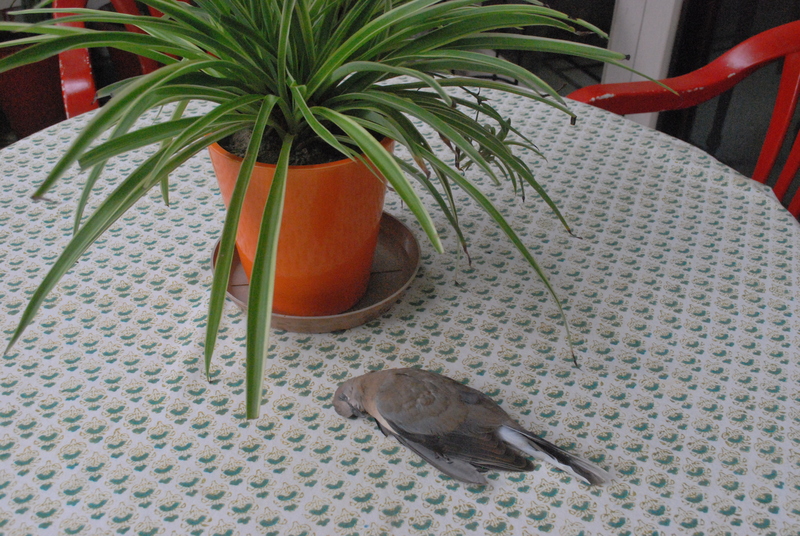 The dove rests on the table. It is 1.30pm. Kuldip and I check for signs of life. There are none. I ask Kuldip to dig a small resting place in the corner of the garden next to the bougainvillea. I stroke the dove’s beautiful feathers. Gently, we place it down in the earth. I softly chant the Maha Mrtyunjaya japa and wish it peace on its onward journey. An instant between life and afterlife is covered in just twenty minutes. I return indoors and cannot finish my remaining lunch. I know for sure you will return. Until your beauty re-appears again. Filed under Birds, Essays, Life.